Located on Bang Tao beach on Phuket’s west coast which is home to some of the best beaches on the island, Laguna Waters is a private villa as part of the Laguna Estate. The villa is a five-bedroom holiday home which features a lot of open spaces, spacious bedrooms, a large swimming pool, tropical vegetation, and ample space for both adults and kids to enjoy themselves. Enjoy with friends and family as you lounge beside the pool on the sun chairs, meditate early morning, play on the beach with the kids, and sunbathe but with sunscreen! Four bedrooms, furnished with double beds, a super spacious layout and large windows with enviable views are the cherry on top of a perfect vacation spot. The comfortable bedrooms feature high-vaulted ceilings, wooden flooring, as well as a comfortable sofa for relaxing times. The air-conditioned bedrooms are found on the lower and upper floor, each offering a scenic view of the neighboring areas of the villa. There are en-suite bathrooms fitted with bathtubs overlooking the outdoors and other amenities. The fifth bedroom is housed in a separate guest pavilion, which features a terrace and glass sliding door that lead to the well-furnished, cozy bedroom. The bedroom is accompanied by an en-suite bathroom which is fully-equipped with amenities and facilities. 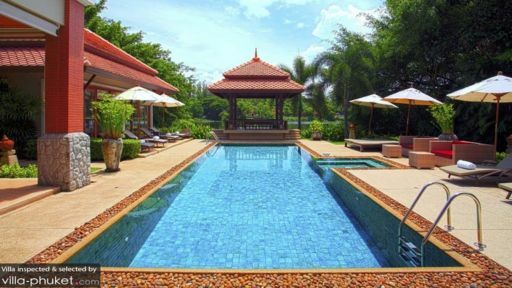 A pagoda stands royally beside the 12-metre swimming pool with a comfortable sitting area for guests to relax on. As you swim under clear blue skies, with the palm trees swaying in the wind, well-manicured gardens to play around on as well as potted plants and lush vegetation for the fresh air, you are sure to feel relaxed. 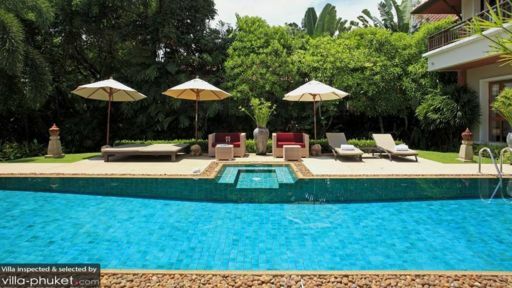 There are ample sitting areas with rattan furniture beside the pool, and so are sun loungers for sunbathing and napping! An outdoor dining area for an alfresco experience is also set up for guests. The villa is home to both indoor and outdoor living spaces which you will discover as you step inside through the porch and enter the air-conditioned living room. With dim lighting and ample natural sunlight, the living area features plush beige and white couches along with ottomans offers a comfortable space for everyone to gather around and relax together. With glass doors leading outdoors to the pool and gardens, you can expressly view the scenes all day from the comfort of your couch. A massive TV is also fitted in the room for your enjoyment. Striking artwork celebrating Thai heritage can be found gracing the walls. A games room and a gym with proper equipment and a pool table can be found on the upper floor. Out on the terrace, you will find deck chairs for relaxation with a drink in hand as you gaze at the beautiful lake and the surrounding tropical vegetation. The dining area is beside the fully-equipped kitchen and has a 10-seater dining table. Another dining area is found outdoors for dining under the stars. Apart from a gym with equipment, there is also BBQ service available to guests where they can enjoy freshly-grilled veggies. The staff is generous towards the guests and are happy to assist you with whatever your needs are. The best part about the villa is its vicinity to the beach, so you can head down immediately without any worries. There are many restaurants in the vicinity for you to try out the local cuisines as well as international cuisines. My family of 6 (3 teenagers and a 21 year old) just returned from King and Ralph's wonderful home at Laguna resort area at Bang Tao beach. If you are looking for spacious, clean, well kept, beautiful to the eye then don't look any further than this house and the Laguna resort complex. The house is huge. We booked the maid's room as well which is just as nice as the rest of the house, just so all our boys could have their own "space" to chill in at night. The furniture is all good with lovely linens and lots of bath and beach towels are provided. The grounds and pool are great. The view is lovely over the lake. We used all the other pools available to us in the resort and ate at some of the restaurants too. Panache restaurant just up the road at The Lofts apartments is really good. The Manager of the house, Dao, is a wonderful person and nothing was too much bother for her. She even gave us a local phone to use while there. The maid does a fantastic job keeping the house clean and calls every 2-3 days to tidy up and change the linen. A highlight of our stay was watching a baby elephant swimming at the beach with us at Bang Tao. So special. All the staff and security at Laguna are so beautiful. Very respectful and polite. If we are lucky enough to be able top go back to Phuket we would not stay anywhere else. The whole complex is magnificent. Thank you King for answering all my emails promptly and for making our Phuket stay fantastic! Great service, easy booking process and quick check in and check out. Nice villa, good sized. Furnishings perhaps a little dated, but nice enough. Had some problems with the a/C in the maids quarter and the outside lights but this was sorted out straight away. Situated in a nice quiet area, restaurant close by and bus stop for shuttle around the Laguna are was right outside the villa. Great family holiday!Great service, easy booking process and quick check in and check out. Nice villa, good sized. Furnishings perhaps a little dated, but nice enough. Had some problems with the a/C in the maids quarter and the outside lights but this was sorted out straight away. Situated in a nice quiet area, restaurant close by and bus stop for shuttle around the Laguna are was right outside the villa. Great family holiday!